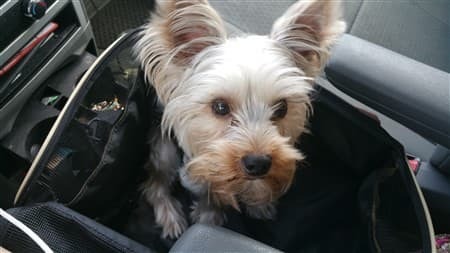 If there is any purchase that you make that had a direct impact on your Yorkie's health to the degree of preventing serious injury and even death, it is a car seat. It's one of those things that some owners might pass over, thinking that perhaps a toy breed dog does not need; after all, it's just so easy to tuck a Yorkie onto your lap or have him snuggle by your side. However, not placing your Yorkie in a certified canine car seat can lead to devastating results. In addition, if you obtain the right type, car seats play a huge role in helping to prevent motion sickness. There are over 6,000,000 million vehicle accidents per year in the U.S. (both those that result in injury or fatality). This equates to 16,438 per day and 6,849 per hour. Even if you are a great driver, this does not mean that it will not happen. 22% of accidents are due to weather and/or road conditions. This includes everything from fog to wet surfaces to snow and ice. You also have zero control over all of the other drivers around you. The Canadian Automobile Association found that distracted drivers (cell phone use, but also attending to a child or a pet) are 3 times more likely to be in a car crash. And on that vein of thought, dogs allowed to be free in the car are distracting. A survey by AAA and Kurgo found that 23% of drivers that do not use a car seat for their pet regularly have to use a hand or arm to restrict a dog's movement when braking. MSG Tech reports that in a high speed accident, 15 to 30 milliseconds after a crash, unrestrained passengers (both humans and dogs alike) impact into the inside of the vehicle. It is 70 to 300 milliseconds afterward that the driver will realize that the accident occurred. And pets can suffer terrible injuries or be fatally wounded, even in slow moving accidents. If a dog is not in a car seat, the force of an accident will throw him (see above bullet point for how it may nearly impossible to hold him yourself depending on the speed) he will be subject to the crash force. This is the force at which an object will is thrown. While there are many variables, the basic math of this is force x speed = velocity. And finally, trauma is the #1 leading cause of death for Yorkshire Terrier puppies and the 3rd cause of death for adults. A shocking 10.7% of Yorkshire Terriers die due to trauma, most of which can be avoided. This includes being hit by a car, being fatally injured while in a car as a passenger, being dropped, being stepped on, and more. A huge factor in how sick a puppy or dog becomes when traveling is how his body and mind perceive the motion of driving. When the body feels movement, but the eyes do not see it (if a dog is huddled on your lap, etc.) this causes an imbalance that leads to feeling nauseous. 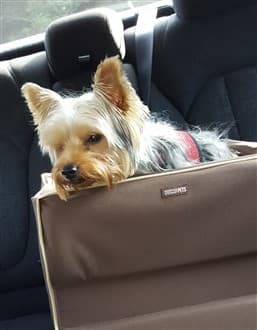 For this reason, if you obtain the right car seat for your Yorkie, it will both allow him to have line of sight and to be up closer to windows; these are both elements that can make being in the car much more pleasant and lower the chances of feeling dizzy and nauseous from motion sickness. Due to this breed's tiny stature, the same sort of canine car seat is best for both puppies and adults. Ease of installation - Some seats have the car's lap belt to run through the back of the seat. And most car booster seats are equipped with straps that then connect over and around the car's seat. This keeps it safe and secure. It must also have a buckle connector; this is a sturdy strap that goes from inside the seat itself to your Yorkie. Do NOT attach this to his collar, doing so can cause him to choke. It is to be connected to his harness. Proper sizing - For both safety and to help fend off nausea, you will want the seat to be small enough to offer a feeling of security, but also have room for a small blanket, a few favorite toys and a treat. Washable material - In case your Yorkie has an accident, makes a mess with treats and for everyday messes that just seem to appear, you'll want a washable cover. Look for a top-rated seat with high user ratings. While getting a cute one can be part of your plan, you'll also want to be sure that it is reliable and durable. Be wary of buying used car seats. Used seats often do not come with proper installation instructions, can be out-of-date meaning that they do not pass today's safety standards and may have internal broken parts that render the seat unsafe. If you have two dogs, you may want to opt for a two-pet bucket seat, so that they can stay together. Below are some top recommended car booster seats that are properly sized, are durable, washable and meet all of the safety standards. If you do not see the images, try a refresh. And on mobile, you may need to turn your screen horizontal to see all 4. 1) As mentioned earlier, but worth repeating, do not connect the inner canine seat buckle to your Yorkie's collar. With any sort of impact, this can cause terrible neck injuries or even death. The connector is meant to be clipped to your dog's harness (even if the photo on the product does not show this). 2) The safest spot to place the car seat is in the middle of the back seat. Understandably, many owners want their Yorkie up in front with them. If you opt to do that, it is recommended that you move the passenger seat as far back as it can go and that you disable any passenger air bags. Air bag deployment can cause serious injury to death both to small dogs and children. 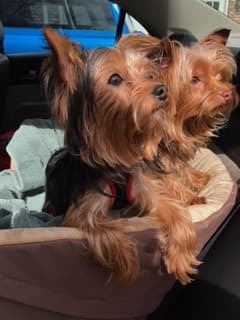 3) If your Yorkie is fussy about being in the car (and the car seat will indeed help with that for most puppies and dogs), you may want to reserve some fun toys only to be given when in the car. Just this alone can make a dog look forward to car trips. Please take the same safety precautions with your Yorkie that you would with a baby. Your dog depends on you to make the right choices and take all steps to keep him safe. With trauma being a leading cause of death for both Yorkie puppies and dogs, responsible ownership could dramatically reduce those numbers. Why is my Yorkie acting strange? If your Yorkie's behavior is off and you know that something is not right, but you can't pinpoint what it is, this article will be of help. How do I fix my Yorkie's bad breath? There are some common reasons why this breed may develop bad breath. This article lists why this can happen, home remedies and red flags that point to a larger issue. Why is my Yorkie refusing to eat? Though this tiny toy breed does not need that many calories to maintain his weight, a Yorkie should be eating 3 small meals a day. Top reasons for decreased appetite and answers about what you can do to encourage eating. 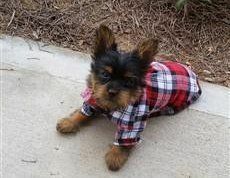 Where can I find cute clothes that fit a Yorkie? Finding cute outfits that fit this tiny breed is not always easy. However, we've rounded up some of the most adorable that are available in XXS and XS. Also, valid reasons why clothing is warranted and how this can help your puppy or dog feel comfortable and tolerate the weather.